Hotel California was a Grammy Award winning hit at the end of the ‘70s, and is still one of the best known songs in the world. To learn how to play this cover of the song, you’ll be needing a guitar capo, so if you don’t have one yet, I suggest you buy one now at your local music shop or online, and watch this lesson after it has arrived. You’ll be learning and practicing several techniques in this lesson. 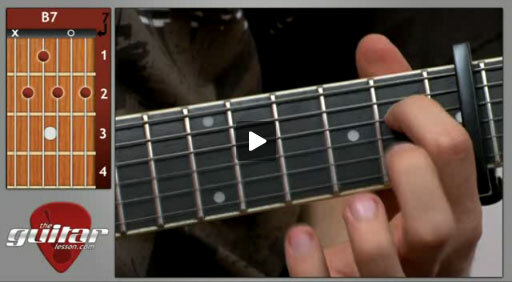 Firstly the correct use of the capo, which is placed onto fret 7 of this song. Usually you would place the capo as close to the fret-bar as possible, but since the space between the frets gets smaller and smaller as you move up the fretboard, remember not to place it too close to the bar, so your hand has enough space to hold down the chords. And many chords there will be, my young padawan guitarist :-). Hotel California uses several chords, some of them will be revision, others totally new ones. You’ll learn the famous intro solo to the song, which is made up of a series of arpeggiated chords, with some minor alterations. Afterwards, you’ll learn the strumming sequences the Eagles plays during the verse, which will give you a chance to practice accented strumming and chord changes. If you’re a beginner guitarist and you haven’t used a capo before, make sure you try it out! You’ll notice that changing chords this high up the fretboard is actually easier than in their normal pitch, since you fingers don’t have to stretch as far. To sum it up, by learning how to play Hotel California, you get the chance to play an awesome, yet easy guitar song, and practice several guitar techniques that will really develop your skills, including chords, chord changes, arpeggios, and strumming. Hotel California was released by the Eagles in 1977 first as a single, than on their fifth album, Hotel California. The single was a huge hit, just like the album itself, winning a Grammy for both Song of the Year and Record of the Year in 1978. The song talks of a luxury hotel in California, that once you enter, you can never leave. This is in fact an allegory for the self-destructive Southern Californian music industry at the time. The song has been covered by many artists, and is a track on the video game Guitar Hero World Tour. Sorry, but you've reached a premium content area. The download of the Hotel California tablature file is only available to premium members. Sorry, the same goes for the backing track. To download the backing track to Hotel California, please log in and revisit this page.